Currently I'm busy with tempo mapping a Foo Fighters song (Rope) to create a backing track (with click) for a coverband. The timing of the original is not so tight, so I am inserting tempo change markers and want to drag them in a way the grid is accurate with the timing. I have followed the explanation in one of Kenny's videos. All went well for the first three or so markers, but after this I can't drag the next marker anymore. AFAIK I didn't accidentally hit a short cut because the first markers are still "drag-able". Has anyone experienced this behaviour in Reaper before? Is it a bug of a feature? Or am I doing something wrong. Please help me out. Indeed, it should work, but it doesn't. I'm working with Windows 10. I doubt this will have a dependacy. Would somebody help me if I provide a screencast showing this behaviour? I seem to remember that I once tried but was not able to find out how it should work. Seemingly it had not been done for my shallow mind. Last edited by mschnell; 06-17-2017 at 11:11 AM. Trying to edit markers and Ctrl drag them per Kenny's instruction in v5.76, and finding the same issue. The first few tempo markers can be adjusted to the grid.. After that you can't drag the grid around them anymore. NM. I was setting up a screen capture and for some reason it started to work. Last edited by Omni; 03-04-2018 at 12:18 AM. Item properties - uncheck "Loop source"? Did anyone solve this? I am also having the same problem on the latest OSX. Just taking a bit of a shot in the dark here but do you, by chance, have snapping enabled? Please do upload a screencast. Same issue here I believe. The "T" that appears to the left of tempo markers in Kenny's video don't appear for me, and that appears to be what he's grabbing. Is this the problem? If so, how do I get them back? If I hold Ctrl and drag the marker with the mouse, nothing happens. It doesn't move. The correct action still appears to be set in the mouse modifier preferences (I've only had Reaper for a couple of weeks and haven't changed anything like that). I can drag them without Ctrl, but then the behaviour is different (moved is on the grid rather than taking the grid with it). Makes no difference whether snapping is enabled or not. The answer seems to be that both the tempo marker and the previous tempo marker MUST be on bar lines for it to work. That's pretty restrictive and I can't think why that restriction would be necessary. I'll report it in the bug forum too. Last edited by SonicAxiom; 09-16-2018 at 04:36 AM. AFAIK, Ctrl+drag and Ctrl+Alt+drag only work on square tempos, not linear ones. The SWS action "Move closest grid line to mouse cursor" -- which is very similar to REAPER's Ctrl+Alt+leftdrag action -- does work on linear tempo changes, and can be linked to Ctrl+Alt+leftclick (or any other mouse modifier) in the Ruler context. However, as you will see if you use the SWS action on linear tempos, any change will necessarily propagate through all preceding points until the start of the project, or until a square tempo is reached, causing far-reaching tempo changes. 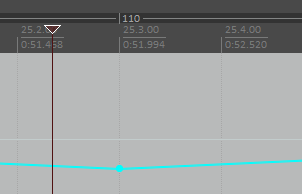 I assume this is the reason why REAPER's native action doesn't work on linear tempos. I was wrong about being on bar lines. See my other post for more details, but quickly, if you have tempo markers A, B & C, then you can only change C if the A-B section is linear. Sounds like SWS doesn't do it right either. If the B-C section is linear, just change the tempo at C not B to get the required time length. No propagating back. This is almost always preferable anyway, eg if A-B is square and the tempo was continuous through B, then changing B breaks this and makes it discontinuous. And for no reason, just change C.
Makes sense to change the tempo of the marker being moved, not the previous one. The only time you should change the previous one is if the segment is square, so its tempo is only affected by B. Are you holding down Ctrl? Yes they can be dragged without a modifier. This moves them to another beat. With Ctrl down as well, it drags the grid with it by changing the previous tempo. With our A, B, C tempo markers, Ctrl-dragging C works if B-C is linear, but it won't function if A-B is linear. And when B-C is linear, it should change the tempo at C not B.
I now see what you have been saying and yes... you are correct... perhaps a bug?